Want to evaluate teachers? Look at teaching. Imagine for a moment that you are a recently-hired police officer, assigned to a local neighborhood or “beat”. Further imagine that you are told by your superiors that your job performance will be assessed by the number of reported crimes on your beat over a certain length of time. 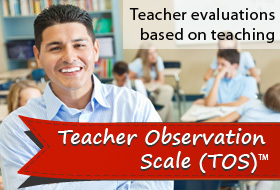 The Teacher Observation Scale (TOS)™ represents a major departure from common methods of teacher evaluation. The TOS employs a behavioral checklist, consisting of a variety of statements describing relevant aspects - both positive and negative - of teacher classroom performance. The InterExam™ program is now available for usage. As InterExam™ is a secure test, organizations wishing to employ InterExam™ with their examinees should contact National Measurement and Evaluation to make arrangements for its use. The Teacher Observation Scale (TOS) ™ is an instrument used for the objective analysis and appraisal of teacher classroom performance, created specifically for teachers by teachers.